The alien Naga tried to destroy all life on Earth, but what doesn't kill us makes us stronger. Six months ago we fought a short but devastating war against the invaders. Our ships burned, and whole cities were annihilated, but we defeated them. Now out of the ashes rises a new Space Force, led by the heroes from that final terrible battle. Beth Wynn wants nothing more from life than to retreat back into the design and invention she's always loved most. But Earth needs her mind and leadership now more than ever. Because not all the ashes are cold and dead. Even in the calm after the fires have gone out, danger lurks close to home. A team sent to the abandoned lunar base vanishes without a trace. Security forces guarding one of the captured Naga starships go silent. Enemies close in, and our very survival will rest on a knife’s edge. In this game of interstellar survival of the fittest, Earth’s heroes will need to put all their courage and brilliance into play to win. This book was a good follow on for the series, the characters developed further and the storyline kept flowing. I found it difficult to put down. 4.0 out of 5 starsA little lacking. This was a bit of a letdown after books 1-6! Once again, you need to have all your books in a row in order to get the full story. Satori has been built a new body, but at the price of her cloak. She is traumatised by John’s death and suffering from depression and self doubt. 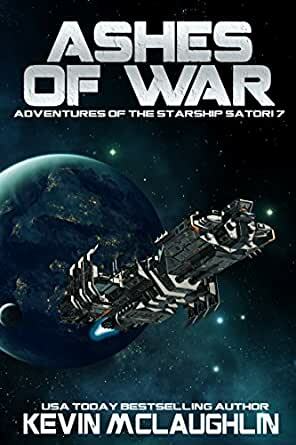 The team has been split up, Andy taking over John’s empire, Dan off in charge of one of the captured Naga vessels and Beth made captain of the new Satori. Charline is with Beth for the new Satotri’s maiden voyage but has a different path ahead of her and Linda isn’t mentioned. Dan is rushing down to Florida where the link to the new ship has gone silent and there is concern that one or more Naga have taken it over. Beth faces her own challenges as a new Captain with an uncooperative First Officer and a monster(s?) lose on Caraday’s moon base. According to the author, readers have requested that he concentrate on fewer characters! Well, for me, that doesn’t work. The dynamic set up with a team has been lost. Yes there was action but it has all been done (better) in the previous books. I was very disappointed. I got spoiled by the 6pk the first stories came in which actually took a while to read. This book not so much. The storyline was OK - a continuation of the story in the first 6 books with some interesting developments. Lots of errors but I guess all kindle books have an issue with spelling, missing words, and added words. 5.0 out of 5 starsEach book simply another chapter in the story - I'm Hooked! Although the series continues after what felt like an end, I still love the action, interaction, and excitement in Ashes of War. It's like each book is an expanded chapter in one big story - wait a minute! It IS one big story - and I love every chapter. Can hardly wait for the next one! This is a terrific start to the new Satori series. Lots of action, moments of suspense. If you have not read the original Satori series, they are a good place to start, however you could pick up the story here and not end up confused. McLaughlin's writing has improved from the early series, the story flows well. I don't want to give much away, but some old favorite characters take on new and challenging roles. I am really looking forward to the next phase of this series. Fits into the Satori saga, but it is rather short. I think I smell a little lazy, or greed, peeking out. No matter. Still a good read. 5.0 out of 5 starsGreat Book, hearty recommendation! Kept my interest to the point the I finished it in a single day.